OK folks. Hold on to your hats. 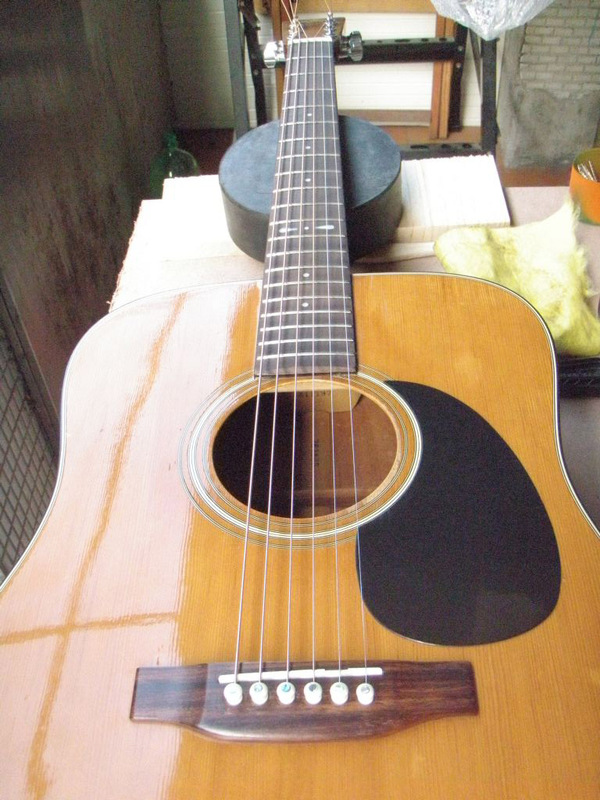 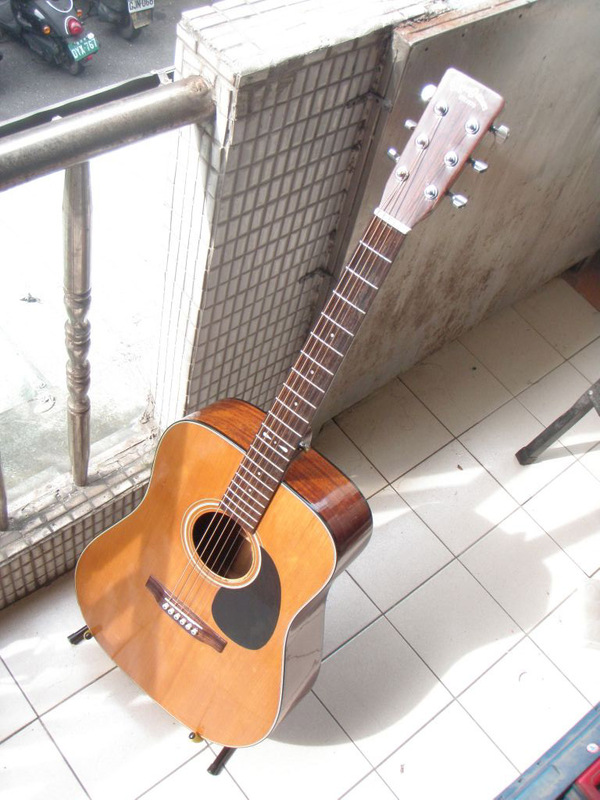 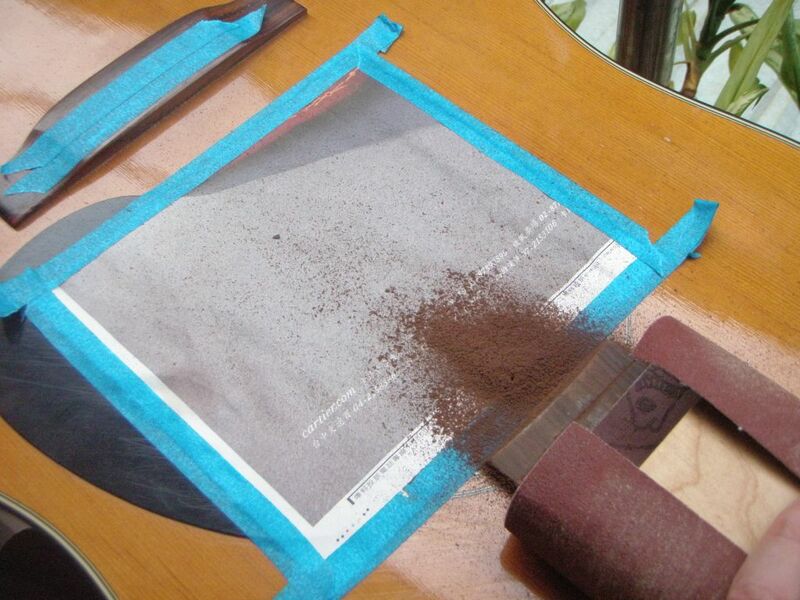 Today we're going to refret an acoustic guitar. 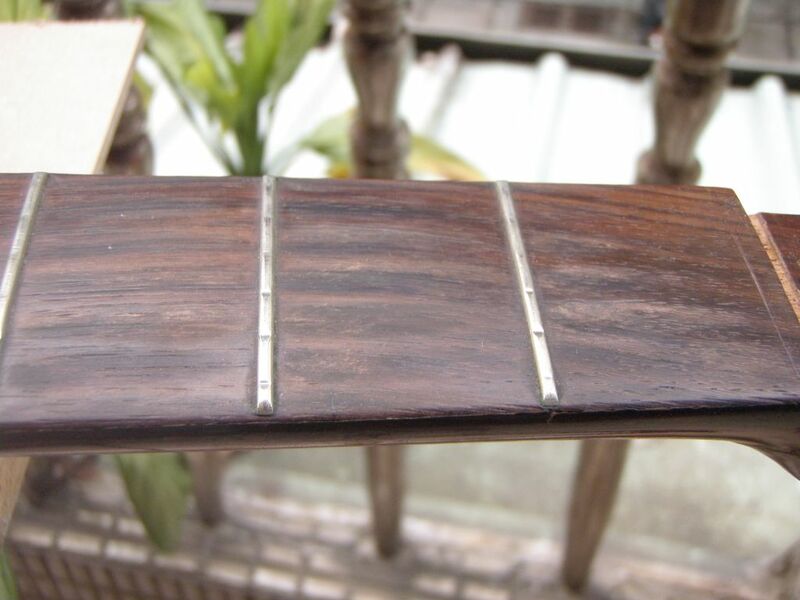 And here's a close-up of the frets and fretboard. As you can see, some of the frets have worn quite badly. 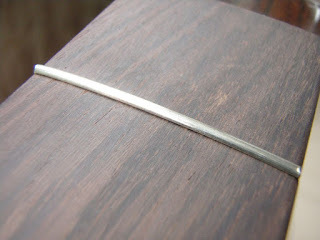 Additionally, there are some pretty serious divots in the rosewood board now too. 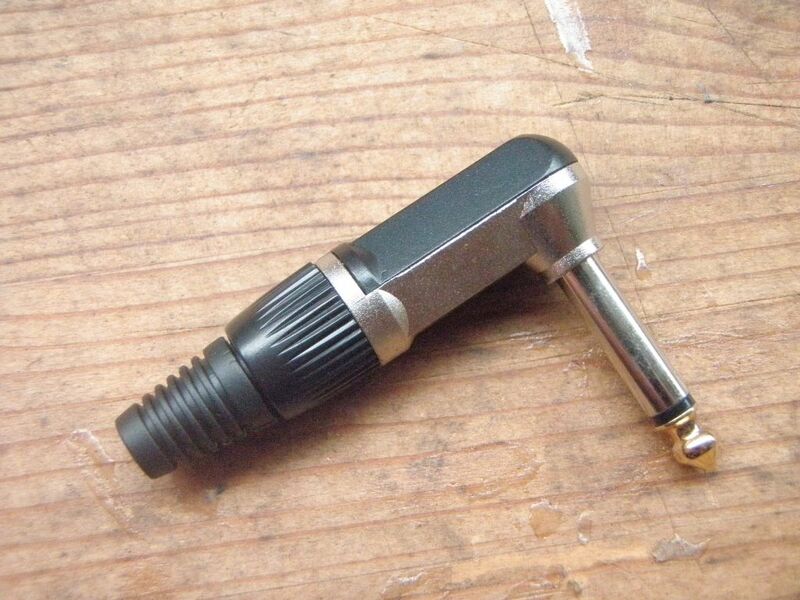 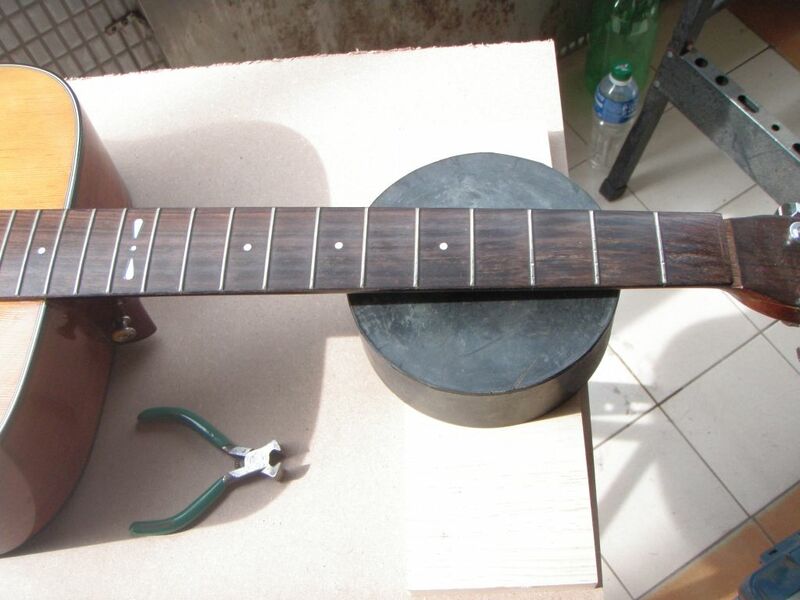 This is going to be one of our main tools for pulling the frets. 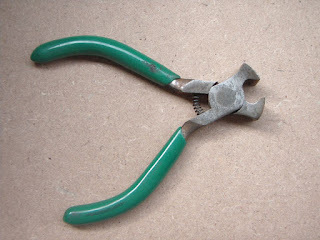 It’s a fairly standard, and very cheap, end cutter. From now on I’ll be referring to it as a “fret puller”. In order to help it get UNDER the frets, we’re going to grind/file the surface flat. I’m resting the neck of the guitar on a huge rubber support, which I can easily move up and down so that it’s directly under whichever fret I’m pulling (or later on, replacing). 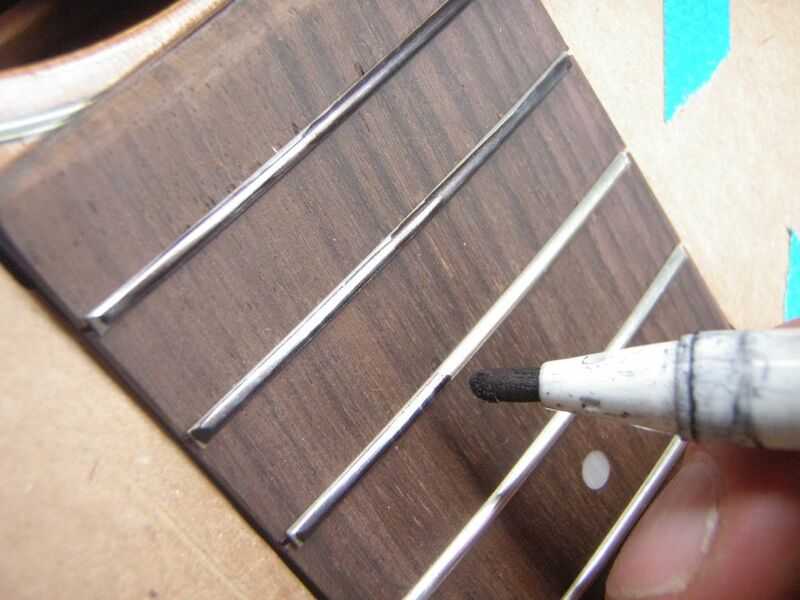 Before we actually start pulling the frets up, we’re going to heat them up with a soldering iron. The one I’m using is 60W with a flat tip on it. 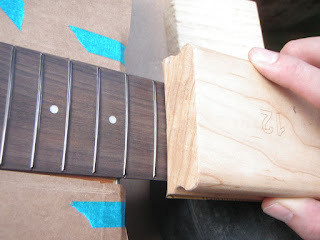 I’ll hold this near one end of the fret for about 30 seconds, moving it around a little, but keeping it towards that end. 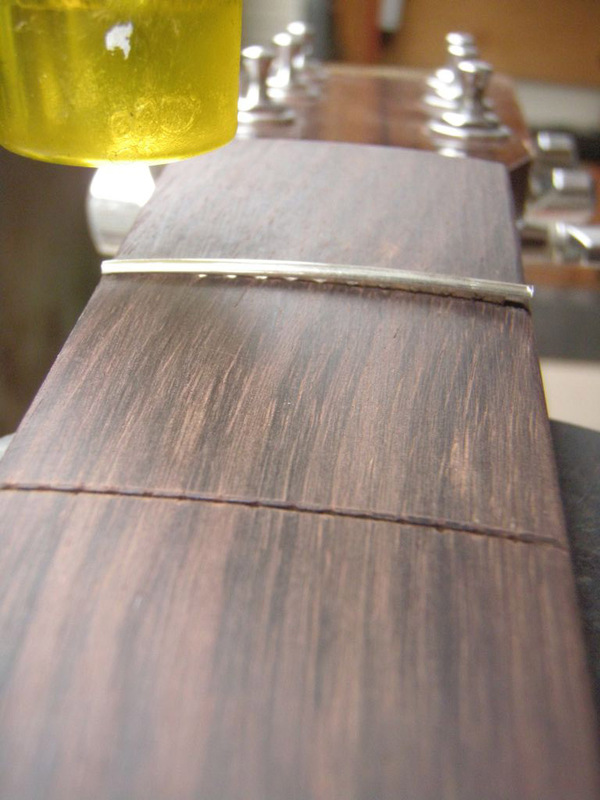 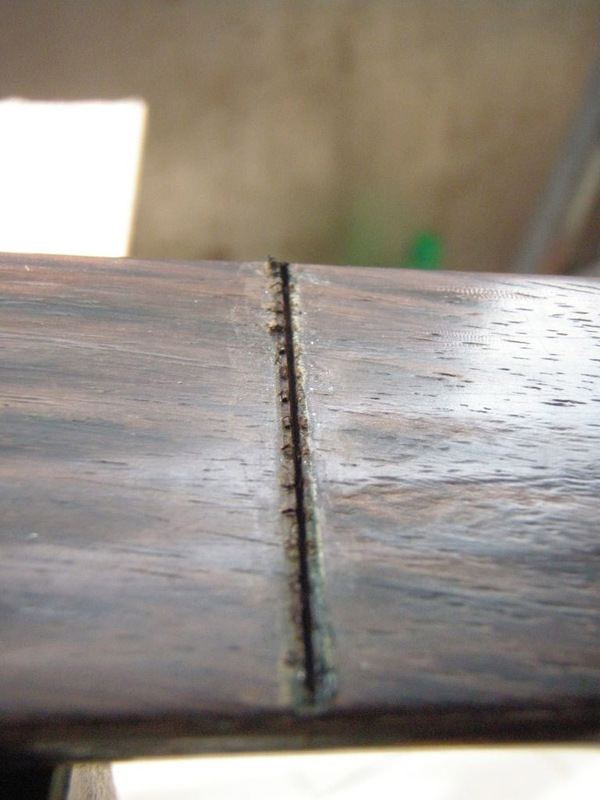 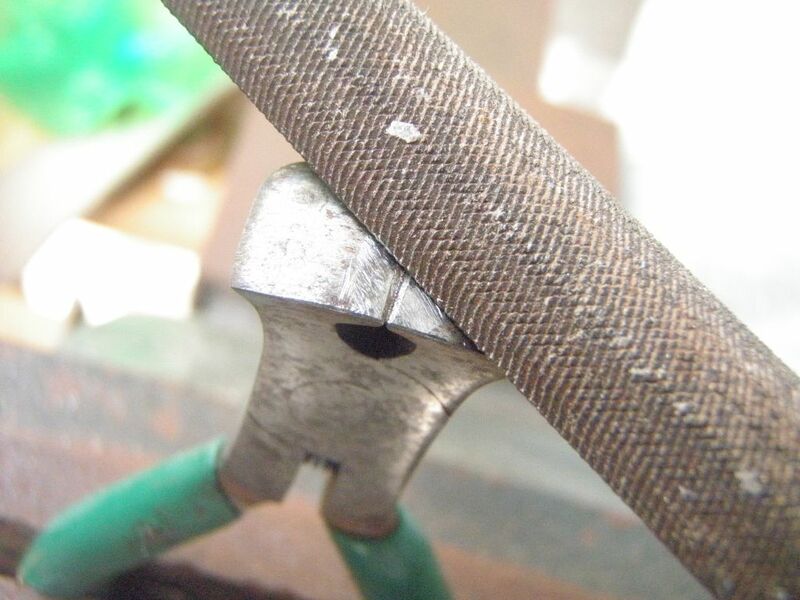 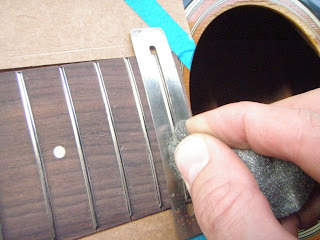 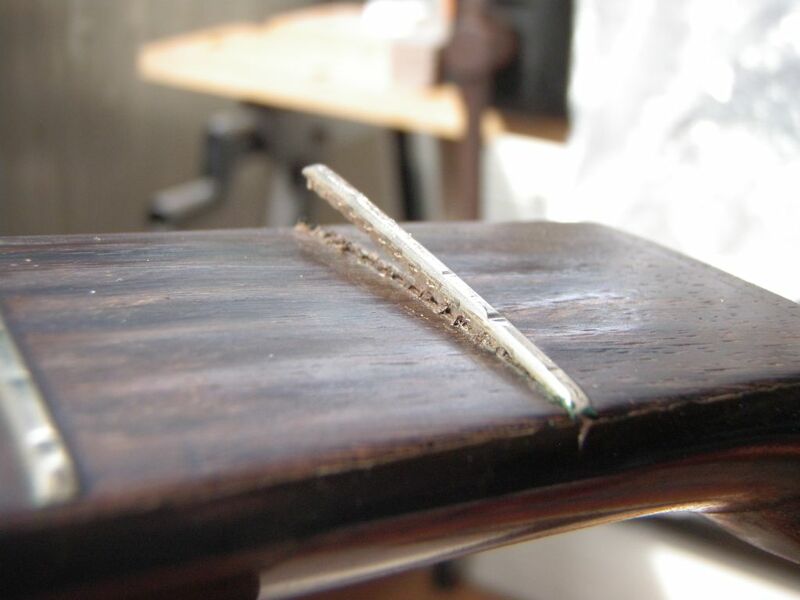 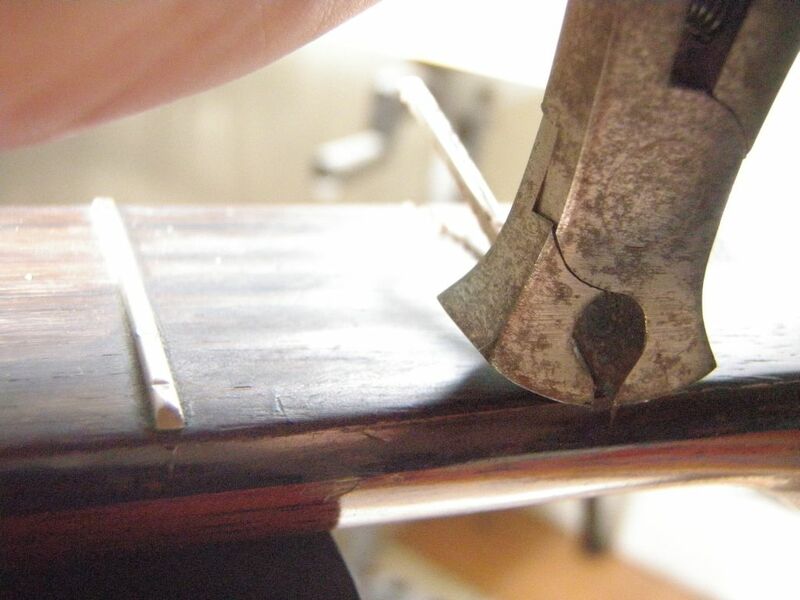 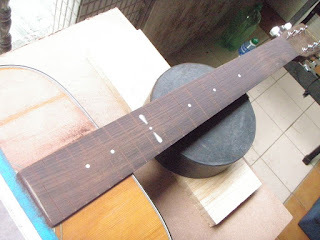 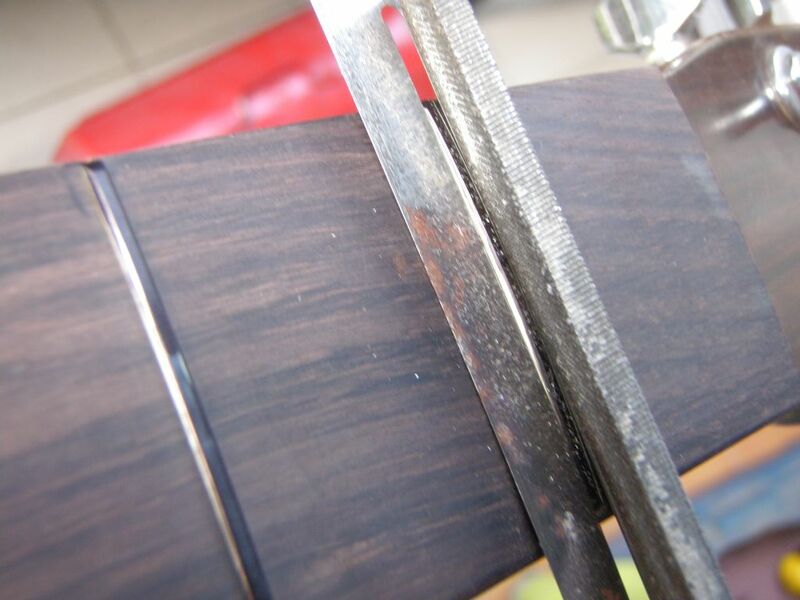 Then we get the fret puller and get it under that end of the fret and slowly encourage it to pull away from the wood. 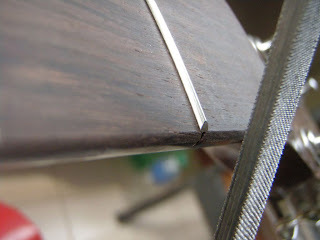 Patience is a virtue at this stage; pull too fast and you’ll remove a chunk of wood while you’re at it. 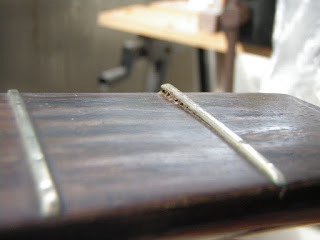 I’d generally still have the soldering iron touching the fret this whole time, by the way, but I had to put it down in order to take this photo. 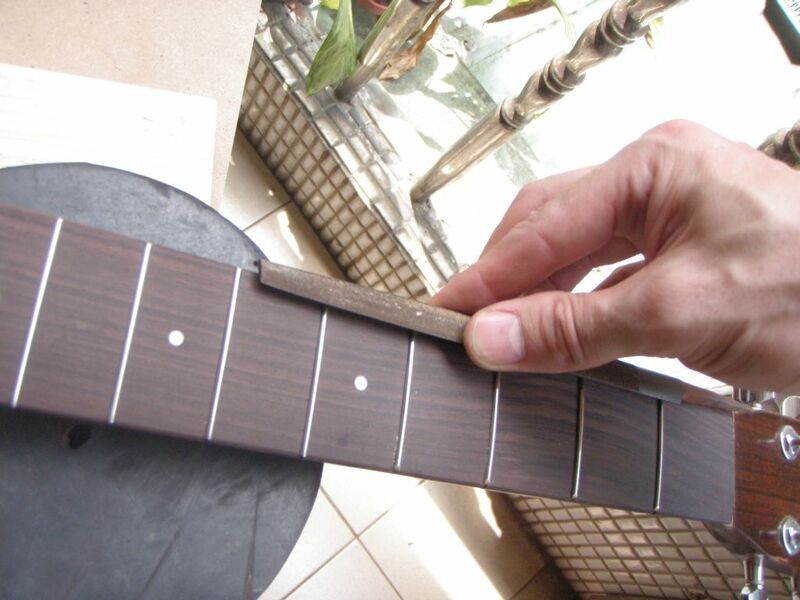 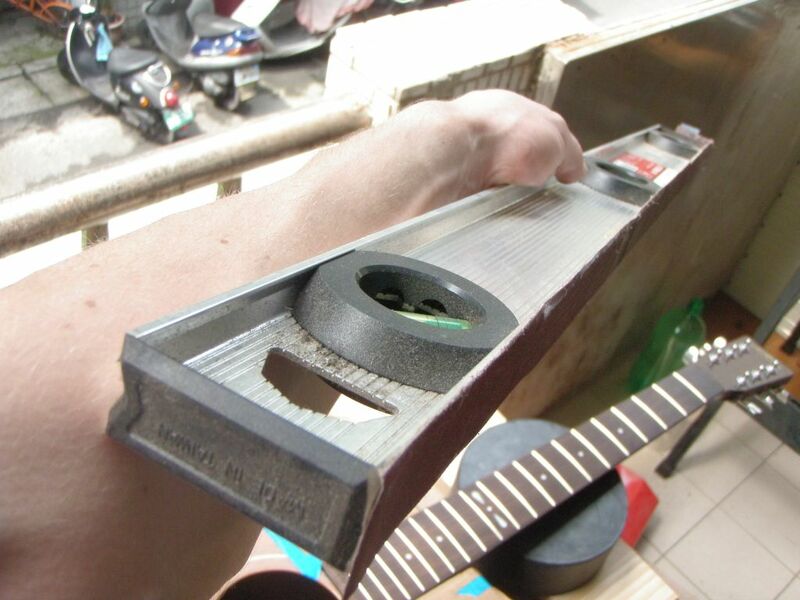 We then start to work our way along the fret with the fret puller, keeping heat on the part we're about to pull up. 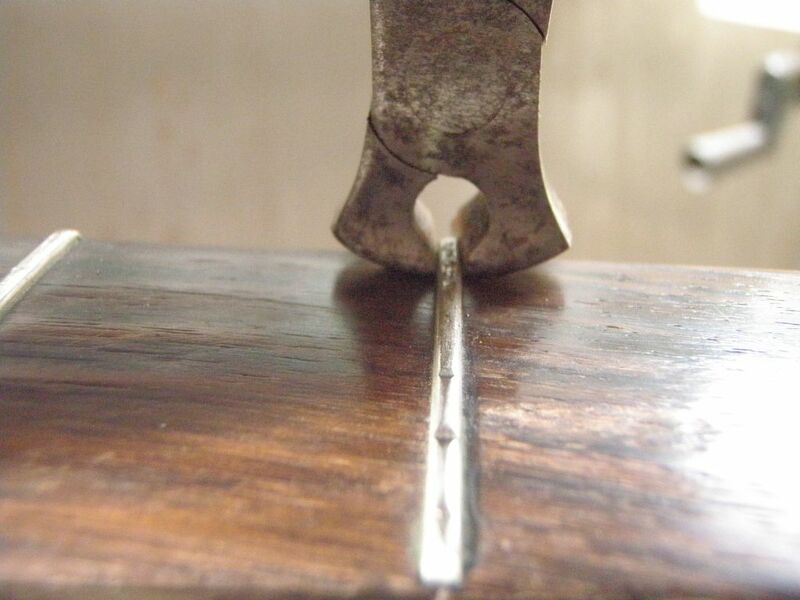 At the very end, take great care as this is a likely place for wood to be pulled out by accident. The same process is repeated for each fret. 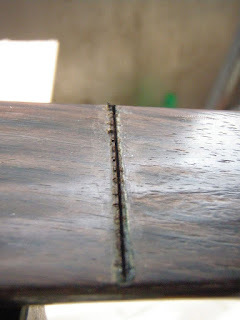 Before putting new frets on, we’re going to fix up the rosewood board itself, removing all those divots in the process. To do this, we’ll use a radiused sanding block (somewhat surprisingly, this guitar has a 12” radius, so we’ll stick with that), with fairly coarse sandpaper (in this case 150 grade, though anything up to 400 or so would probably work fine). 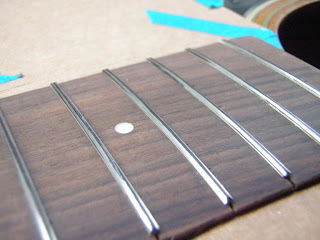 The fretboard is sanded down until the divots are removed completely (luckily there’s plenty of material to work with). Of course the same amount of material needs to be taken off all along the fretboard. 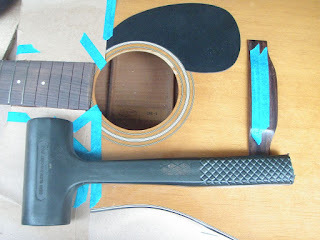 I should add that we've taped off the soundhole so that the guitar doesn't end up getting filled with rosewood dust. In fact, this is a good way to collect the dust, which, mixed with super glue, can make a very good filler in the future. 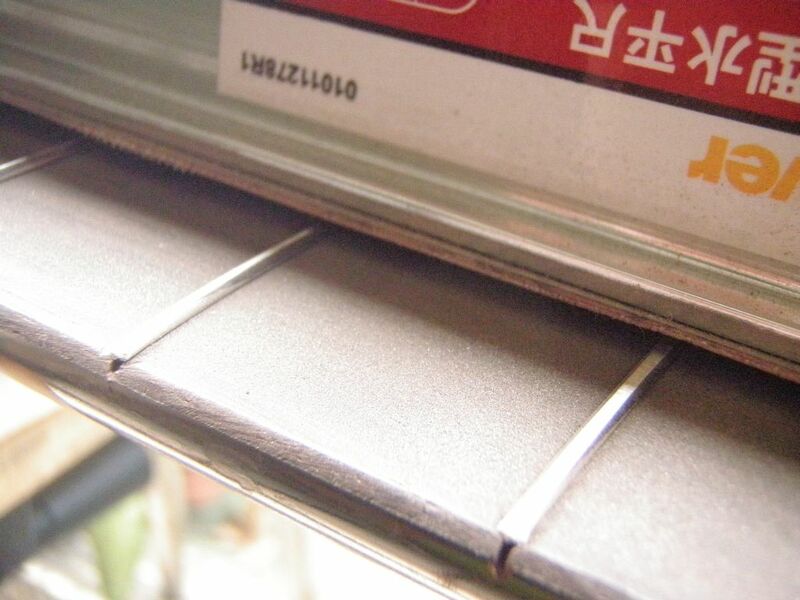 Before installing any frets, the fret slot edges are bevelled with a triangular file. This will help minimise the risk of any wood lifting when we hammer in the new frets (or widen the slots). Now the fret installation begins. 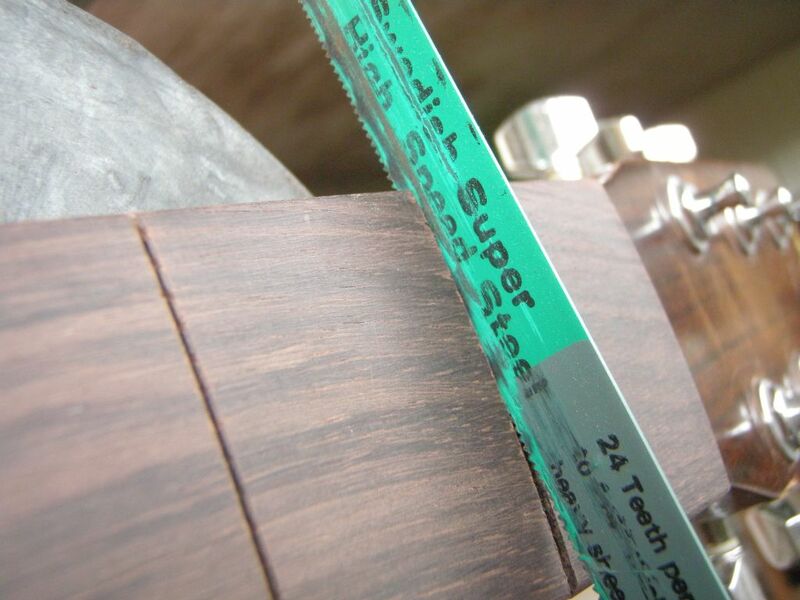 We’re using pre-radiused, pre-cut-to-length frets for this. We used this method before when refretting the Hofner Colorama here: http://diystrat.blogspot.com/2011/11/re-fretting-guitar-neck.html, and it worked out great there. 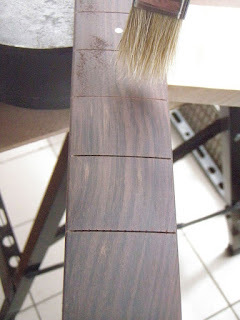 However I think this will be the last time we use this method, as some of the frets at the upper end of this fretboard (farthest from the nut) were cut a bit shorter than I would’ve liked). 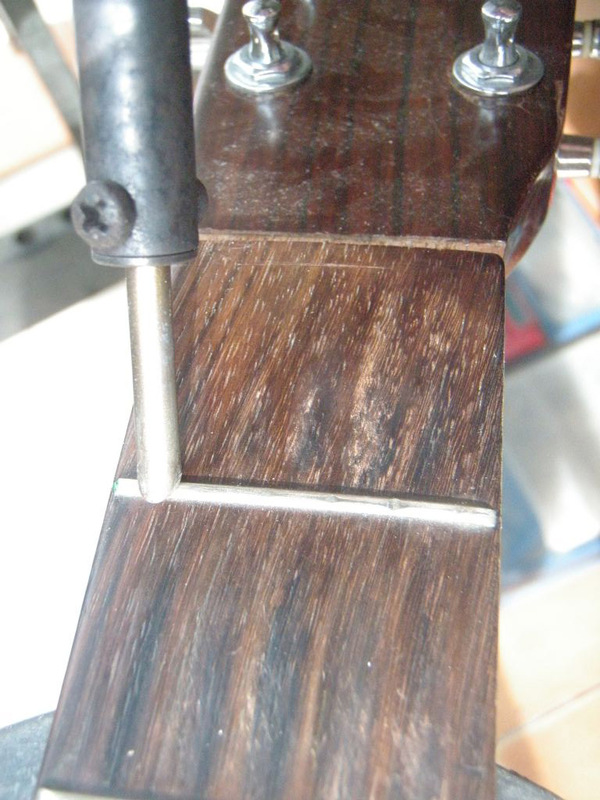 As it happens, the fret tang width is just a bit too much for the slots we already have on this guitar, so they're cut a bit wider with a hacksaw. Luckily the blade on this saw cuts the slots at the perfect width for these frets. 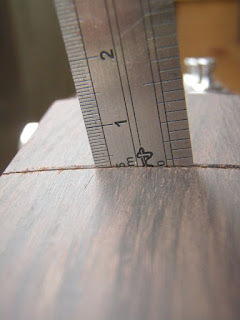 I’m lucky enough to be able to fit a ruler into the slots in order to check they are deep enough (in this case we need 2mm depth), but if you find yourself doing this and can’t fit a ruler in there, you can using something like an exacto knife blade marked at 2mm to test the depth instead. 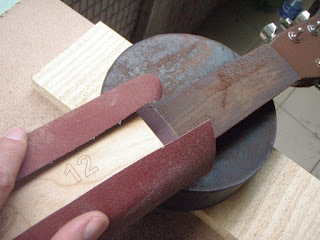 Then we can either hammer in the other end before hammering in the middle, or we can just keep going along from one end to the other. 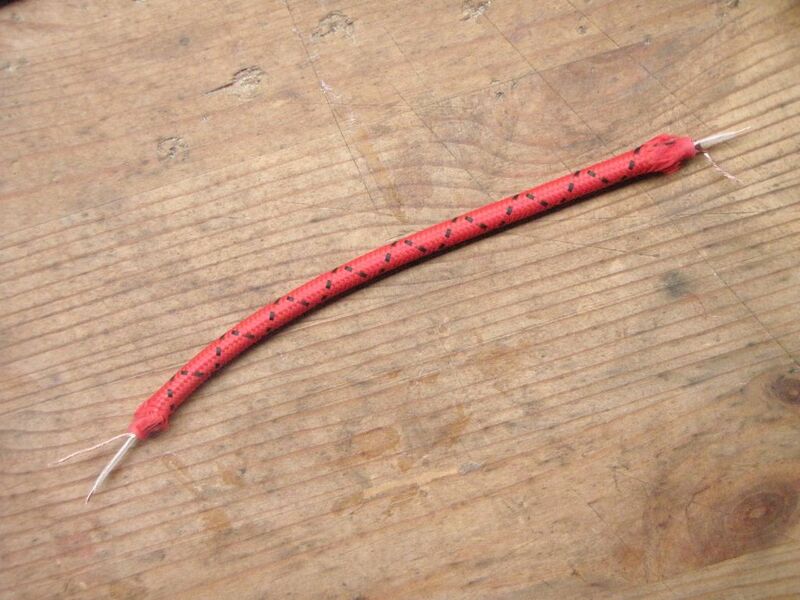 I tend to do both ends first. OK, that’s one fret done. 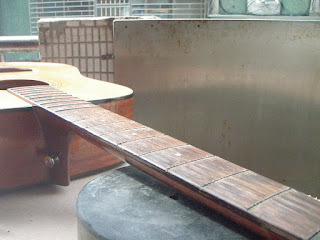 Except of course we’re not finished at all. 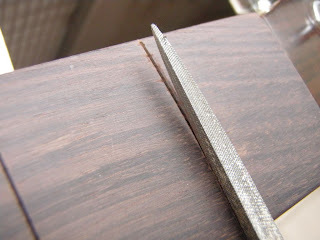 Now we have to bevel the edges of the frets so we don’t rip our hand to bits when we try to play the guitar. After that, we need to level the frets, which is to say that we need to make sure the frets are all the same height. 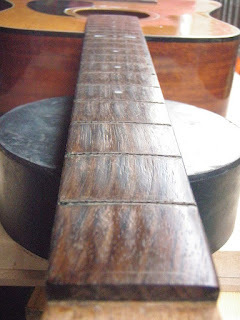 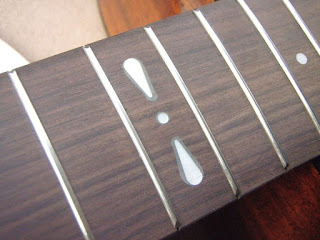 Once the black marks have disappeared, the frets should be level. 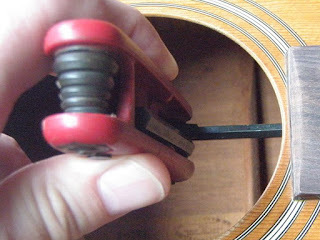 The next step isn't STRICTLY necessary, but I like to do it just in case I've inadvertently affected the radius of the frets. 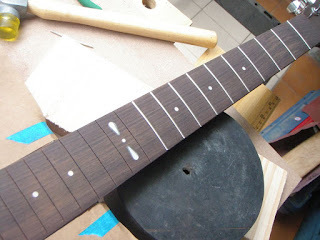 We mark the frets again, and then run the radiused sanding block up and down a few times until all of the black is gone. This should be a very quick process. 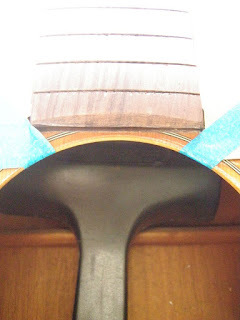 Now we need to crown them, which is to say that we need to re-shape them so that they are rounded on the top. 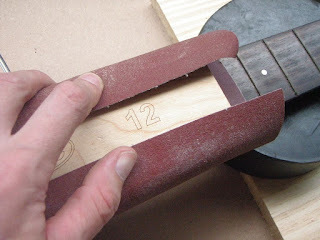 So we mark them with a Sharpie again, and we file them to give them a kind of bevelled/rounded edge. 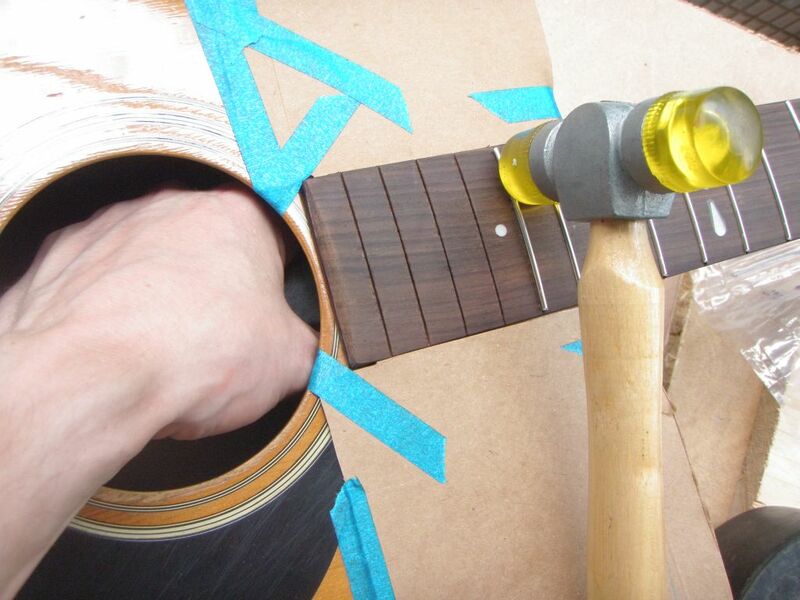 You’ll notice that I am using fret protectors so that I don’t damage any of the wood while doing this. 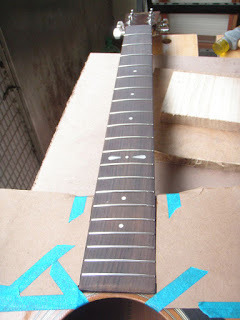 What we want to end up with is a thin black line still showing along the centre of each fret. This way we know that we have not affected the overall height of any of them. Finally we run some steel wool up and down each fret to clean/polish/smooth them. 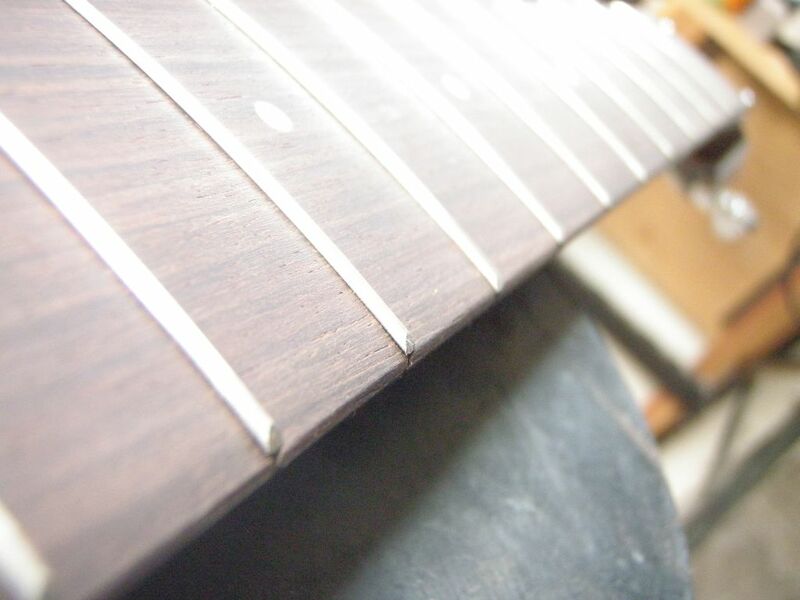 We give each fret the same amount of attention so that if we are removing any material, at least it will be the same for each fret. 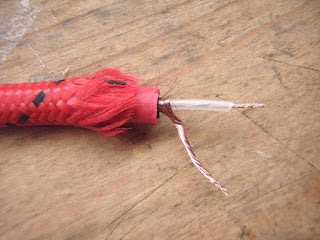 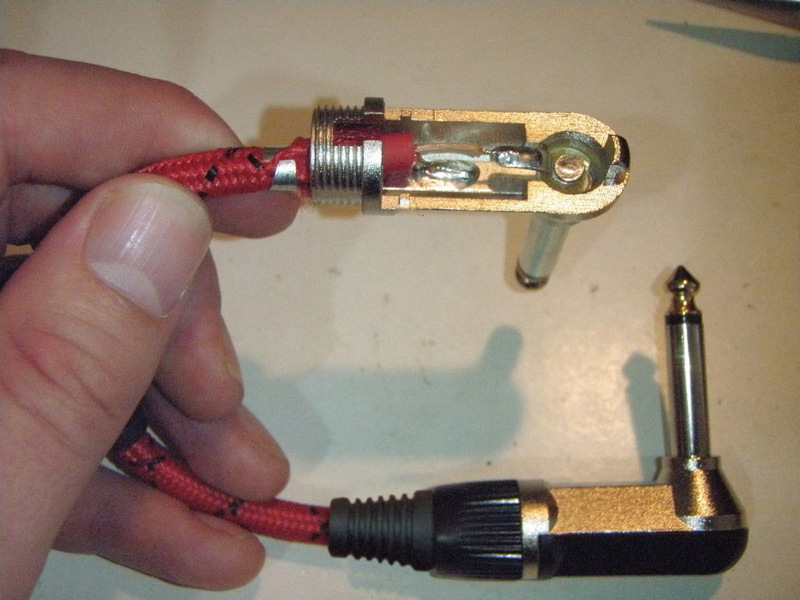 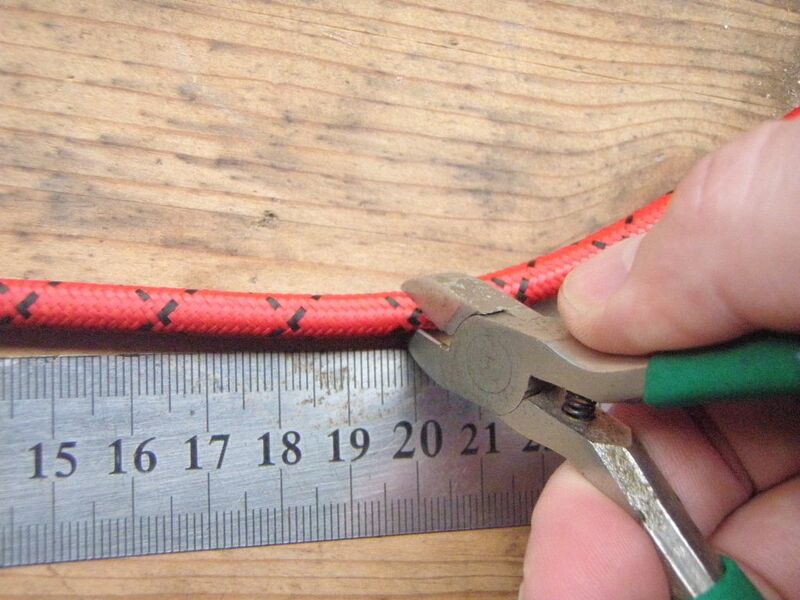 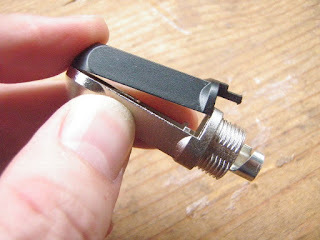 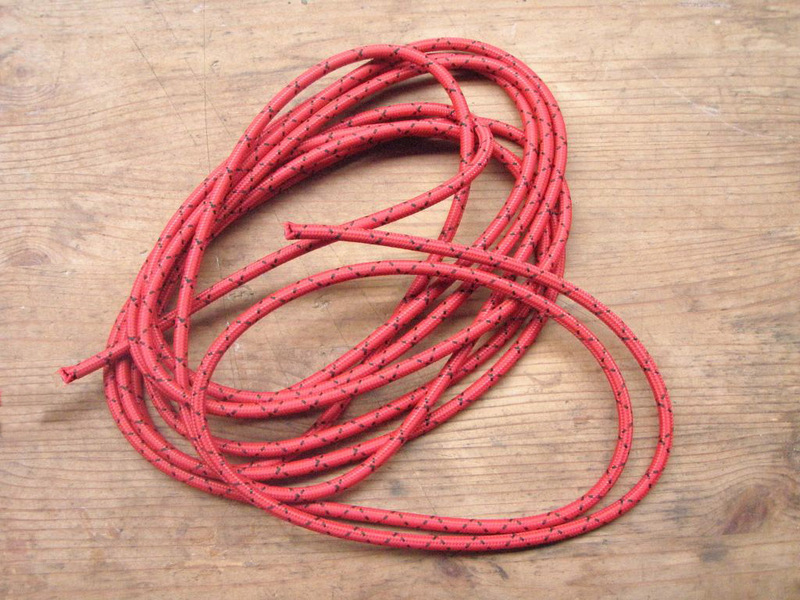 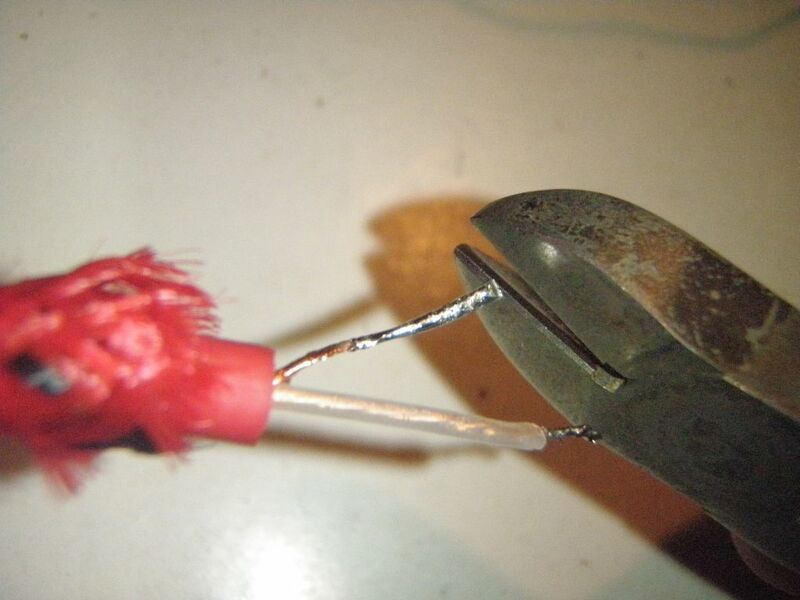 Today we're going to do a quick run through of how to make a guitar cable. It’s a pretty simple procedure, but if you’ve never made one before, it can be a little bit daunting at first. 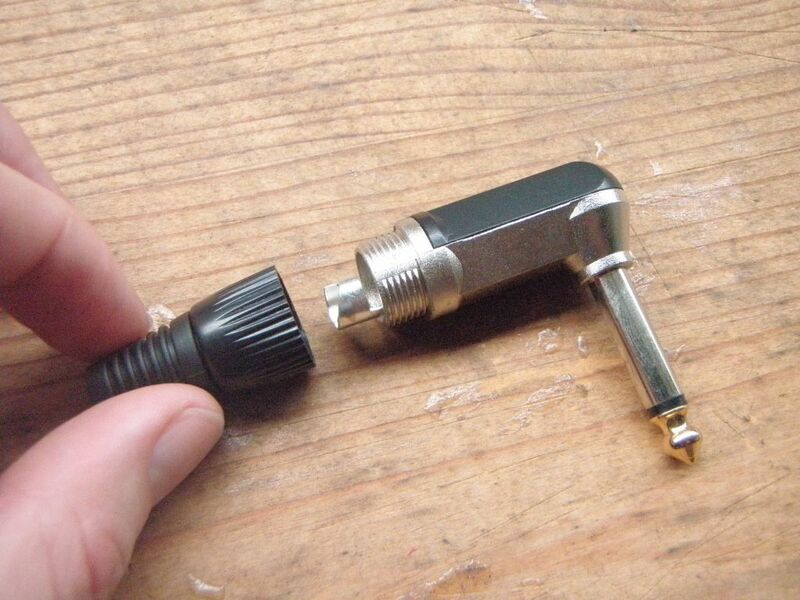 Obviously you can use a different design if you like. Today we're making a short cable that will go between effects pedals. 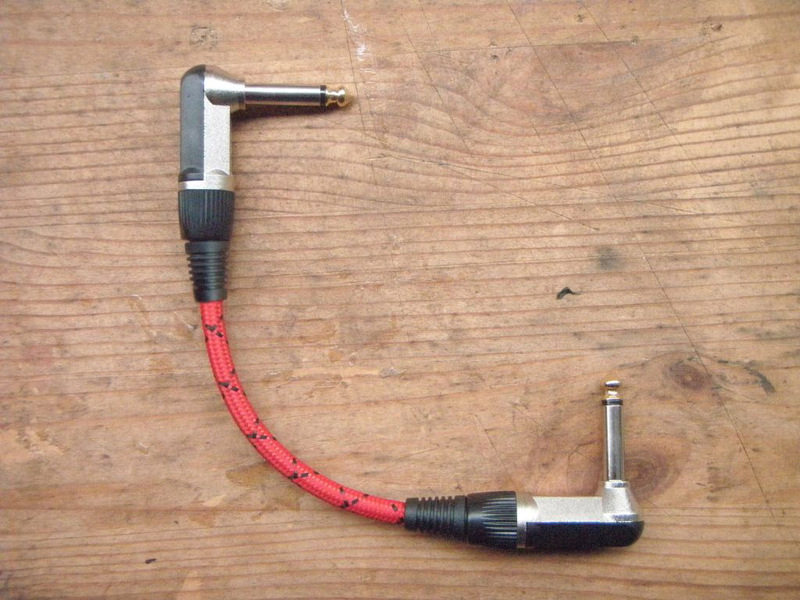 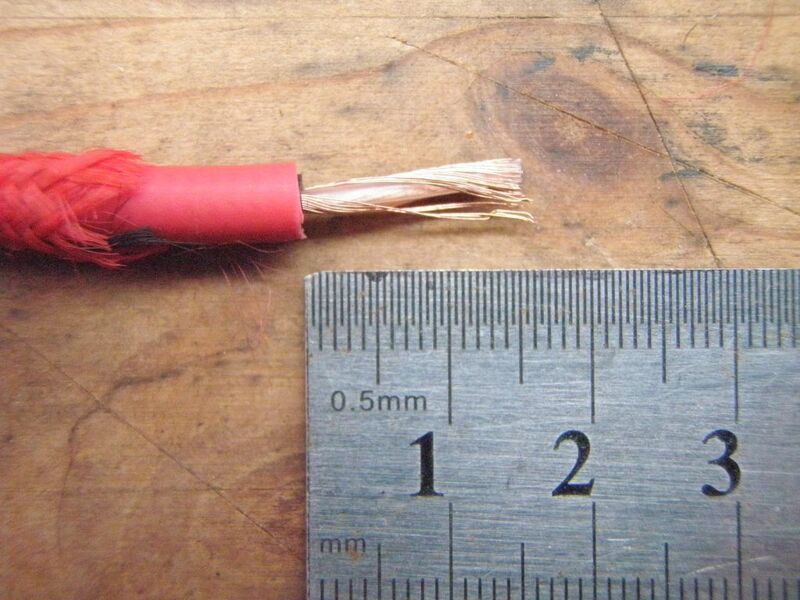 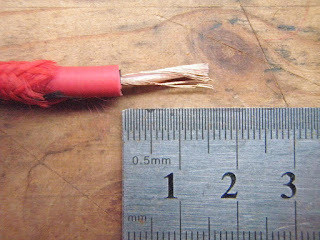 There’s nothing different between this sort of cable and a standard guitar cable, apart from the length. 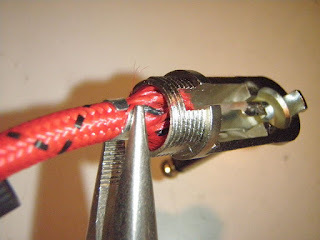 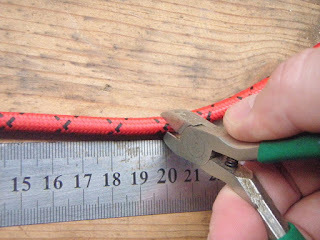 We then slide any necessary items over the cable before doing any soldering. 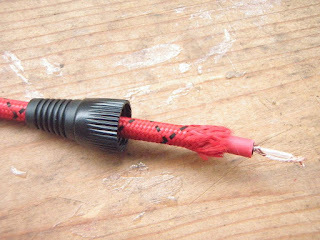 You’ll get away with forgetting this for the first plug, since you can always slide it on from the other end after soldering. 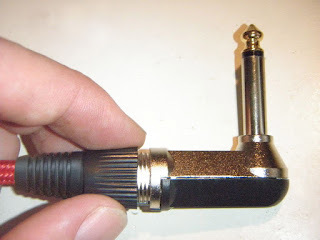 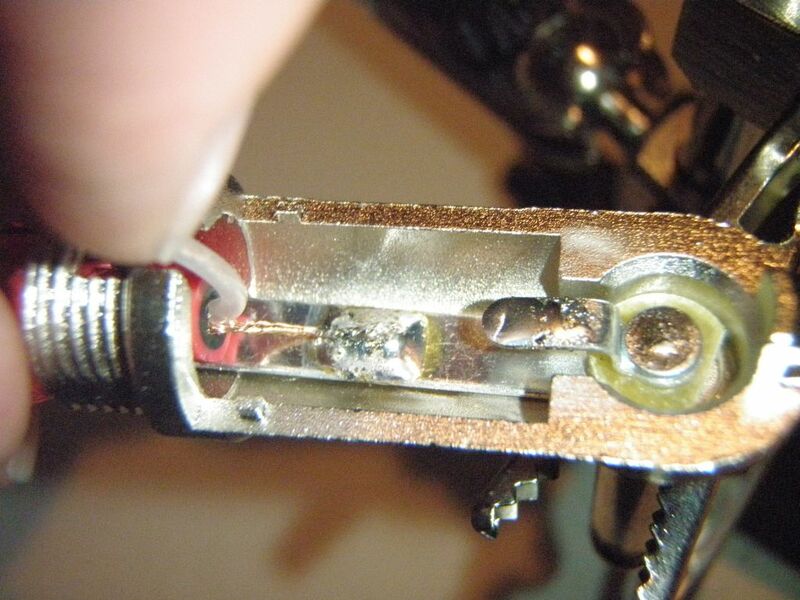 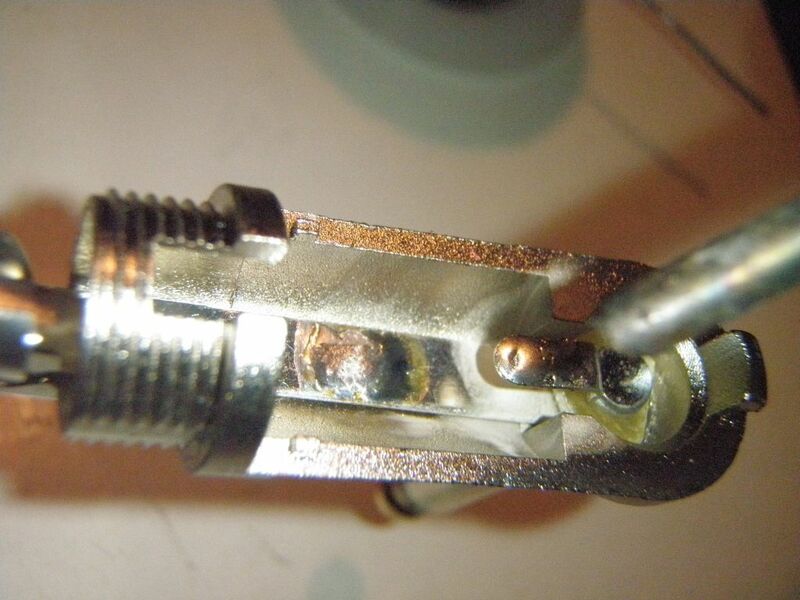 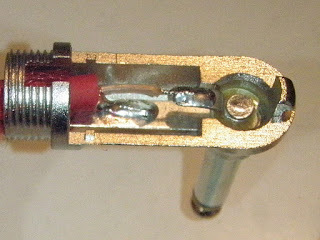 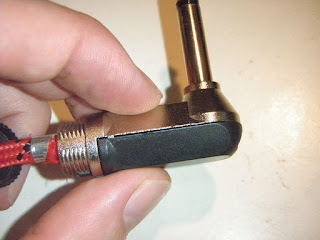 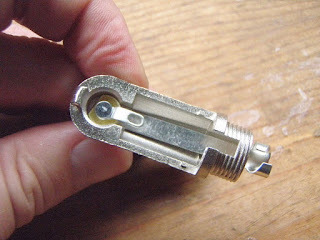 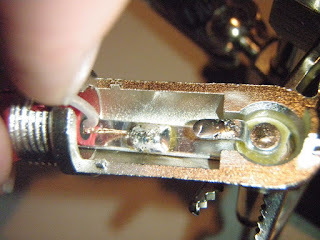 However, for the second plug, it’ll be too late and you’ll have to unsolder something to fix it. Next step is to melt a couple of healthy blobs of solder onto the two positions where we intend to attach wires. 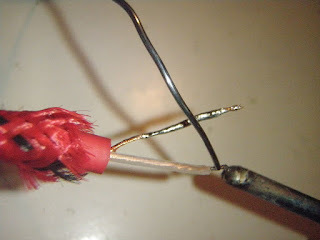 Now we solder the wires on. When doing this, try not to keep the soldering iron on the plug for an extended amount of time, as some of them can be ruined very easily.